A user can sign in and sign out. An authenticated user can create a post. An authenticated user can update a post. Only the user who has ADMIN role can delete a post. All users(including anonymous users) can view post list and post details. An authenticated user can add his comments to a certain post. The frontend is an Angular based SPA and it will be generated by Angular CLI. The source code is hosted on Github, check here. Make sure you have already installed the following software. The quickest approach to start a Spring Boot based is using the Spring initializr. Open browser, and navigate to http://start.spring.io. 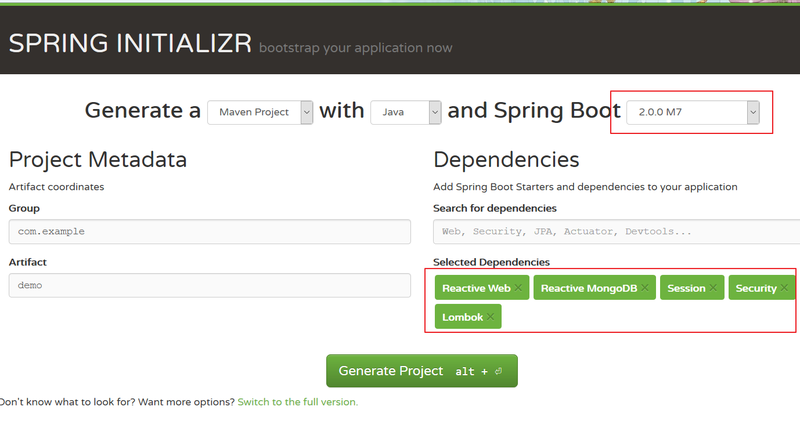 In the search dependencies box, search reactive, select Reactive Web, Reactive MongoDB in the search results, and then add Security, Session, Lombok in the same way etc. Hint Generate Project button or press ALT+ENTER keys to download the generated codes. Extract files into your local system, and import it into your favorite IDE. Let's start with cooking the Post APIs, the expected APIs are listed below. Create a Post POJO class. Add Spring Data MongoDB specific @Document annotation on this class to indicate it is a MongoDB document. To remove getters and setters, toString, equals, hashCode methods from Post and make the source code looks clearly, let's use Lombok specific annotations to generate these required facilities at compile time via annotation processor tooling support. Create a PostRepository interface for Post document. Make sure it is extended from ReactiveMongoRepository, which is the reactive variant of MongoRepository interface and it is ready for reactive operations. Let's create a PostController class to expose RESTful APIs. It is very similar with traditional Servlet based @RestController, the difference is here we use Reactor specific Mono and Flux as return result type. NOTE: Spring 5 also provides functional programming experience, check spring-reactive-sample for more details. Create a CommandLineRunner component to insert some dummy data when the application is started. Now we are almost ready to start up the application. But before this you have to make sure there is a running MongoDB instance. I have prepared docker-compose.yml in the root folder, utilize it, we can bootstrap a MongoDB instance quickly in Docker container. Open your terminal, and switch to the root folder of this project, run the following command to start a MongoDB service. NOTE: You can also install a MongoDB server in your local system instead. Now try to execute mvn spring-boot:run to start up the application. Or click Run action in the project context menu in your IDE. When it is started, open another terminal window, use curl or httpie to have a test. You should see some result like this. Next let's add access control rules to protect the Post APIs. Like traditional Servlet based MVC, when spring-security-web is existed in the classpath of a webflux application, Spring Boot will configure security automatically. To customize security configuration, create a standalone @Configuration class. In this configuration, we defined a SecurityWebFilterChain bean to change default security path matching rules as expected. And we have to declare a ReactiveUserDetailsService bean to customize the UserDetailsService, eg. fetching users from our MongoDB. Create the required User document and UserRepository interface. In UserRepository, add a new findByUsername method to query user by username, it returns Mono<User>. In the real world, in order to protect REST APIs, token based authentication is mostly used. Spring Session provides a simple strategy to expose the session id in http response headers and check validation of session id in http request headers. Currently, Spring Session provides reactive supports for Redis and MongoDB. In this project, we use MongoDB as an example. Add spring-session-data-mongodb into the project classpath. To force HTTP BASIC authentication to manage sessions by MongoDB, add the following configuration in SecurityConfig. Declare WebSessionIdResolver bean to use HTTP header to resolve session id instead of cookie. Expose current user by REST APIs. When the user is authenticated, the user info can be fetched from an injected Principal. Add the initial users in the DataInitializer bean. Restart the application and have a try. As you see, there is a X-AUTH-TOKEN header in the response headers when the authentication is successful. Try to add X-AUTH-TOKEN to HTTP request headers and access the protected APIs. curl -v http://localhost:8080/auth/user  -H "X-AUTH-TOKEN: 39af0166-0f5f-4a1a-a955-21340b0b31b1"
Yeah, it works as expected. You can try more example on other protected path, such as creating and updating posts. For traditional Servlet stack, we can use @ExceptionHandler to handle the exceptions and convert them into HTTP friendly messages. In a webflux based application, we can declare a WebExceptionHanlder bean to archive this purpose. For example, if there is no posts found by id, throw a PostNotFoundException, and finally convert it to a 404 error to HTTP client. Declare PostNotFoundExcpetion as a RuntimeException. Throw an PostNotFoundException when it is not found, eg. the get method in PostController. Declare a WebExceptionHanlder bean to handle PostNotFoundException. For the bean validations, we can convert the WebExchangeBindException to a UnprocessableEntity error to client, please see the complete codes of RestExceptionHandler for more details. In the backend codes, I have added some features mentioned at the beginning of this post, such as comment endpoints, and also tried to add pagination, and data auditing feature(when it is ready). Next let's try to build a simple Angular frontend application to shake hands with the backend APIs. The latest NodeJS, I used NodeJS 9.4.0 at the moment. Your favorite code editors, VS Code, Atom Editor, Intellij WebStorm etc. Make sure it is installed correctly. Open your terminal, execute the following command to generate an Angular project. Install Angular Material, Angular FlexLayout from Angular team. Some Material modules depend on @angular/animations. Import BrowserAnimationsModule in AppModule. To enable gesture in Angular Material, install hammerjs. Follow the official Angular Style Guide, use ng command to generate expected modules and components. We will enrich them later. To simplify the coding work, I port my former Angular 2.x work to this project, more about the Angular development steps, check the wiki pages. Angular 4.x introduced new HttpClientModule(located in @angular/common/http) instead of the original @angular/http module. I updated the original codes to use HttpClientModule to interact with REST APIs in this project. Let's have a look at the refreshed PostService. Here we use new HttpClient to replace the legacy Http, the usage of HttpClient is similar with Http, the most difference is its methods return an Observable by default. Another awesome feature of the HttpClientModule is it added the long-awaited HttpInterceptor officially. We do not need @covalent/http to get interceptor support now. Compare the HTTP interceptor provided in @covalent/http, the official HttpInterceptor is more flexible, and it adopts the middleware concept. Check the complete source codes from my github.